"Improving our nation's child-care system will have a compound effect," said Aleyamma Mathew, director of the Women's Economic Justice Program of the Ms. Foundation for Women. "Not only on the millions of women in the workforce but on communities and the economy as a whole." Many parents lack have access to adequate child care, most child-care providers earn low wages, and the entire U.S. child-care system needs to be overhauled, according to a new report published Wednesday by the Ms. Foundation. The report, Raising Our Nation: Forging a More Robust and Equitable Childcare System in America, examined the gender and racial inequalities that the country’s child-care system reflects and reinforces. The report notes that child care in the United States is exceedingly expensive, and that the cost of child care has been rapidly rising while median income for families has decreased over the past decade. The average cost of child care in 2013 was $11,666 per year, according to the National Association of Child Care Resource & Referral Agencies, as reported by Forbes. An analysis by the Economic Policy Institute (EPI) found that in 33 states and Washington, D.C., child-care costs were higher than the average cost of in-state tuition at public universities. Infant care is particularly expensive. Aleyamma Mathew, director of the Women’s Economic Justice Program of the Ms. Foundation for Women, said during a press call that the report is part of the organization’s focus on building an integrated child-care movement. The report outlines a framework for improving the system by calling for a holistic approach to the related issues of child-care access, child-care quality, and job quality as well as increased investment from both the public sector and employers. Younger said during a press call that the report gives a “full picture of the changing landscape” for parents and child-care providers around the country. “We know that even middle class women in middle class families find it virtually impossible to find quality affordable child care, and for low-income women, this is among their greatest challenges,” Younger said. Mathew said that reforming the child-care system will have a ripple effect throughout the economy. 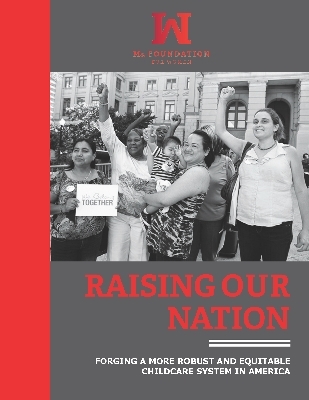 Raising Our Nation: Building a More Robust and Equitable Childcare System in America provides a comprehensive look at our country's childcare landscape, including its underlying gender- and-race-based inequities. profiles of key stakeholders, including Ms. Foundation for Women grantees who are championing the cause of universal childcare access and the childcare workforce. View the executive summary here.